Red diamonds are so rare, the world may be about to run out. The Argyle Diamond Mine, in the north of Western Australia produces 90 percent of the world’s red diamonds, and is expected to close within the next two to three years. If you’re an obscenely wealthy individual with more money than sense, now is the time to gather up your big dollars and get yourself involved in the rush for the final few red diamonds. Alternatively, if you’re a smart shopper who just loves to look good, put your faith in science. The Rouge Red Collection features teardrop cut, red DiamondAura® stones, that deliver all the ravishing beauty of red diamonds without the cost. These stones were carefully created using advanced technology to produce a superior color and clarity to the red diamonds that the billionaires will soon be fighting over. 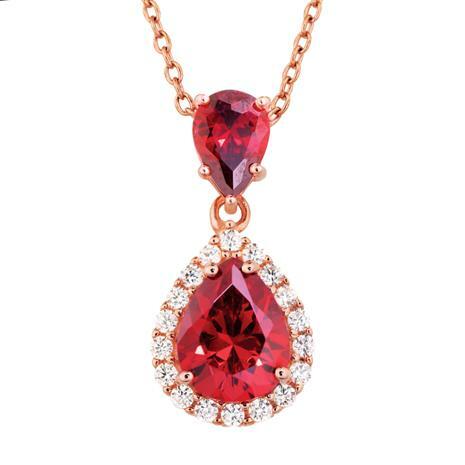 The rich red of those stones is a luxury look that can be yours today, but may never be mined again. To thumb our nose at the obscenely wealthy, we’ve deliberately priced this collection to be affordable. So, go ahead and revel in the luxurious look of red diamonds without going in the red.